By TLex ROAMER have released a 333 piece Limited Edition dive watch in celebration 125 years of since they were founded. The Stingray Chrono-Diver Ref. 1970 takes much of its look from a model of the same name from 1970. Its Stainless steel case measures 44mm in diameter. 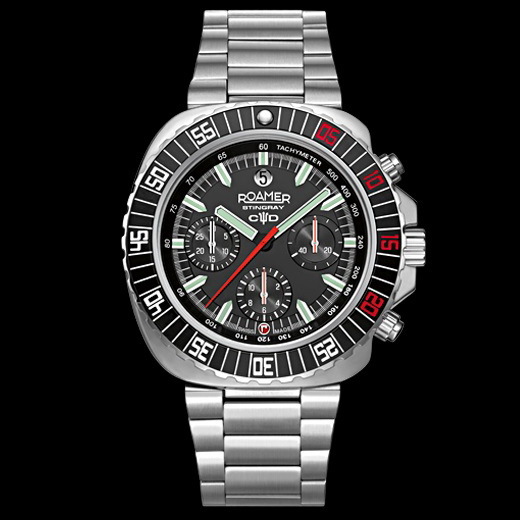 It is fitted with a Sapphire crystal with anti-reflective coating as well as a unidirectional rotational divers bezel with vintage-style elapsed dive time scale. It is water resistant to 100 meters. The watch is powered by a Swiss made movement, the 2824 / Dubois Depraz 2025 Chrono Module with 49 jewels, 28,800 vph, a power reserve of 42 hours and a date function with the display at 12 o'clock. The Stingray Chrono-Diver comes in a commemorative box, which includes: a book detailing the history of Roamer along with an additional vintage-style leather strap with red stitching. this watch Looks great. My Father´s got an old Roamer from the seventies, which is now vintage. Do you know, when this watch will be on market? Can you say anything how much it will cost?